When I cracked open Soupy Saturdays with the Pain & the Great One, I was in San Francisco visiting my sister. "Wow," I said to her. "This book is great. But it seems familiar." "It is familiar," she said. "Don't you remember? There's a Pain and the Great One story in Free to Be...You and Me. You were the Great One and I was the Pain." Talk about a blast from the past. Once she mentioned me calling her "the Pain," it all came back. Free to Be...You and Me was a staple in our home. My sister and I had it memorized. I'm sorry I called you the Pain, Kara! 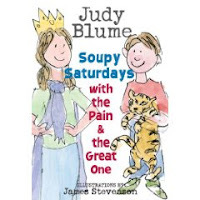 So after thirty three years Judy Blume brings the Pain and the Great One back for more adventures in the 2007 Soupy Saturdays with the Pain & the Great One. (The first The Pain and the Great One was published as a picture book in 1974.) And the Pain--a first-grade boy named Jacob--and the Great One--a third-grade girl named Abigail--are just as relevant as they were in the 1970s. Sibling rivalry never gets old. In Soupy Saturdays with the Pain & the Great One, the Pain faces a dreaded hair cut, plays soccer, and teases his sister. The Great One has bigger problems: She's in third grade and can't ride a bike. Even the Pain can ride a bike! Abigail has resorted to telling her friends she Rollerblades faster than they can bike and that her bike is broken anyway. It's a delicate situation and not the only sticky scenario Abigail faces: She also throws a half birthday party only one child can attend and changes her name to Violet Rose--an attempt at originality that fails miserably. See? Everyday, humorous kid situations. But Blume's sympathetic touch and skillful narrative technique make Soupy Saturdays with the Pain & the Great One a winner. This book--a book written for newly emergent readers--had me turning the pages past midnight. The alternating narration between the Pain and the Great One works beautifully--each voice is distinct and neither the Pain nor the Great One dominates the story. Indeed, the story is forged from their two, and sometimes conflicting, points of view. Soupy Saturdays with the Pain & the Great One is highly recommended for all children ages four to nine and to anyone of any age who has a sibling. Enjoy! A review of Cool Zone with the Pain & the Great One will follow later this week.